Chichester Property News: How much is a bedroom in Chichester? Many first-time buyers will start out with a small ‘starter’ home, which is both suited to their needs and matches their modest earnings at the beginning of their careers. But as you get older there’s a tendency for extra possessions to pile up and for extra people to emerge in your life! This made me think; how much is a bedroom in Chichester and how much does it cost to climb the property ladder? Let’s start with a one-bedroom property (typically a flat). The average price for one of these in Chichester is £189,950. As many will appreciate, the first step is often the hardest and that’s no exception when it comes to buying a property. The income and deposit you’ll require to afford even the most modest of homes in Chichester is probably the greatest barrier to getting on the property market. 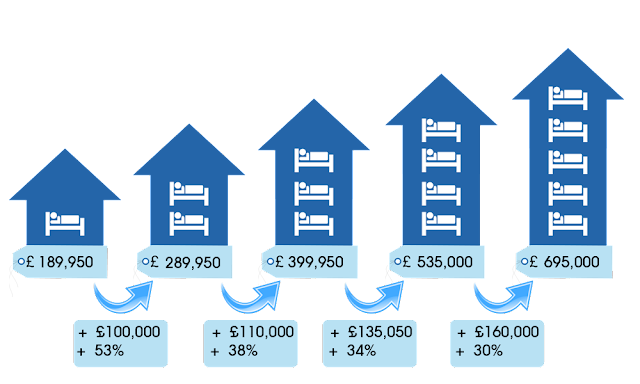 Once you do though, and you hopefully rise through the ranks in your chosen career whilst growing your nest, the increase in price to afford an extra bedroom becomes a little easier as time goes by. The average two-bedroom property in Chichester will cost you £289,950 - a premium of £100,000, or 53%, compared to a one-bedroom home. The average three-bedroom property in Chichester will cost you £399,950 - a premium of £110,000, or 38%, compared to a two-bedroom home. The average four-bedroom property in Chichester will cost you £535,000 - a premium of £135,050, or 34%, compared to a three-bedroom home. The average five-bedroom property in Chichester will cost you £695,000 - a premium of £160,000, or 30%, compared to a four-bedroom home. The above shows that whilst the outright cost grows, the comparative growth in percentage terms lessens as a property expands. Of course, the price increase as you climb the ladder isn’t just for an extra ‘bedroom’. As the number of bedrooms grow, so should the size of the other rooms throughout the house as well as the outside space and amenities e.g. garden/garage/driveway. It does however demonstrate that it’s the first couple of steps that are the toughest on the property ladder, which is why I feel it’s right that government policies and incentives focus primarily on first-time buyers. Having said that, it would be nice if they also considered that the need for an additional bedroom effects the ‘upsizers’ at a time when the financial strain (a new child being the most common) is often at its greatest.